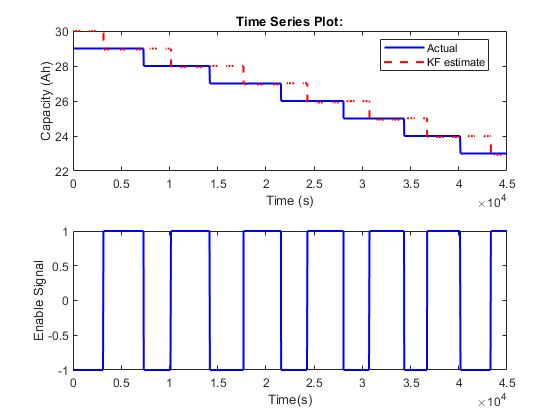 The Extended Kalman Filter block estimates the states of a discrete-time nonlinear system using the first-order discrete-time extended Kalman filter algorithm. Using the state transition and measurement functions of the system and the extended Kalman filter algorithm, the block produces state estimates x^ for the current time step. For information about the algorithm, see Extended and Unscented Kalman Filter Algorithms for Online State Estimation. You create the nonlinear state transition function and measurement functions for the system and specify these functions in the block. The block supports state estimation of a system with multiple sensors that are operating at different sampling rates. You can specify up to five measurement functions, each corresponding to a sensor in the system. You can also specify the Jacobians of the state transition and measurement functions. If you do not specify them, the software numerically computes the Jacobians. For more information, see State Transition and Measurement Functions. Measured system outputs corresponding to each measurement function that you specify in the block. The number of ports equals the number of measurement functions in your system. You can specify up to five measurement functions. For example, if your system has two sensors, you specify two measurement functions in the block. The first port y1 is available by default. When you click Apply, the software generates port y2 corresponding to the second measurement function. Specify the ports as N-dimensional vectors, where N is the number of quantities measured by the corresponding sensor. For example, if your system has one sensor that measures the position and velocity of an object, then there is only one port y1. The port is specified as a 2-dimensional vector with values corresponding to position and velocity. The first port y1 is available by default. Ports y2 to y5 are generated when you click Add Measurement, and click Apply. Additional optional input argument to the state transition function f other than the state x and process noise w. For information about state transition functions see, State Transition and Measurement Functions. Here k is the time step, and StateTransitionFcnInputs is an additional input argument other than x and w.
If you create f using a MATLAB® function (.m file), the software generates the port StateTransitionFcnInputs when you click Apply. You can specify the inputs to this port as a scalar, vector, or matrix. If your state transition function has more than one additional input, use a Simulink Function block to specify the function. When you use a Simulink Function block, you provide the additional inputs directly to the Simulink Function block using Inport blocks. No input ports are generated for the additional inputs in the Extended Kalman Filter block. f requires only one additional input argument apart from x and w.
Additional optional inputs to the measurement functions other than the state x and measurement noise v. For information about measurement functions see, State Transition and Measurement Functions. Here k is the time step, and MeasurementFcn1Inputs and MeasurementFcn2Inputs are the additional input arguments to h1 and h2. If you specify h1, h2, and h3 using MATLAB functions (.m files) in Function, the software generates ports MeasurementFcn1Inputs and MeasurementFcn2Inputs when you click Apply. You can specify the inputs to these ports as scalars, vectors, or matrices. If your measurement functions have more than one additional input, use Simulink Function blocks to specify the functions. When you use a Simulink Function block, you provide the additional inputs directly to the Simulink Function block using Inport blocks. No input ports are generated for the additional inputs in the Extended Kalman Filter block. You specify h in Function using a MATLAB function, and h is on the MATLAB path. h requires only one additional input argument apart from x and v.
Process noise is Additive — Specify the covariance as a scalar, an Ns-element vector, or an Ns-by-Ns matrix, where Ns is the number of states of the system. Specify a scalar if there is no cross-correlation between process noise terms, and all the terms have the same variance. Specify a vector of length Ns, if there is no cross-correlation between process noise terms, but all the terms have different variances. Process noise is Nonadditive — Specify the covariance as a W-by-W matrix, where W is the number of process noise terms in the state transition function. This port is generated if you specify the process noise covariance as Time-Varying. The port appears when you click Apply. Measurement noise is Additive — Specify the covariance as an N-by-N matrix, where N is the number of measurements of the system. Measurement noise is Nonadditive — Specify the covariance as a V-by-V matrix, where V is the number of measurement noise terms in the corresponding measurement function. A port is generated if you specify the measurement noise covariance as Time-Varying for the corresponding measurement function. The port appears when you click Apply. Suppose that measured output data is not available at all time points at the port y1 that corresponds to the first measurement function. Use a signal value other than 0 at the Enable1 port to enable the correction of estimated states when measured data is available. Specify the port value as 0 when measured data is not available. Similarly, if measured output data is not available at all time points at the port yi for the ith measurement function, specify the corresponding port Enablei as a value other than 0. A port corresponding to a measurement function is generated if you select Add Enable port for that measurement function. The port appears when you click Apply. This port is generated if you select Output state estimation error covariance in the System Model tab, and click Apply. The state transition function calculates the Ns-element state vector of the system at time step k+1, given the state vector at time step k. Ns is the number of states of the nonlinear system. You create the state transition function and specify the function name in Function. For example, if vdpStateFcn.m is the state transition function that you created and saved, specify Function as vdpStateFcn. The inputs to the function you create depend on whether you specify the process noise as additive or nonadditive in Process noise. where x(k) is the estimated state at time k, and Us1,...,Usn are any additional input arguments required by your state transition function, such as system inputs or the sample time. To see an example of a state transition function with additive process noise, type edit vdpStateFcn at the command line. For more information, see State Transition and Measurement Functions. You can create f using a Simulink Function block or as a MATLAB function (.m file). You can use a MATLAB function only if f has one additional input argument Us1 other than x and w.
The software generates an additional input port StateTransitionFcnInputs to specify this argument. If you are using a Simulink Function block, specify x and w using Argument Inport blocks and the additional inputs Us1,...,Usn using Inport blocks in the Simulink Function block. You do not provide Us1,...,Usn to the Extended Kalman Filter block. off — The software computes the Jacobian numerically. This computation may increase processing time and numerical inaccuracy of the state estimation. on — You create a function to compute the Jacobian, and specify the name of the function in Jacobian. For example, if vdpStateJacobianFcn.m is the Jacobian function, specify Jacobian as vdpStateJacobianFcn. If you create the state transition function f using a Simulink Function block, then create the Jacobian using a Simulink Function block. If you create f using a MATLAB function (.m file), then create the Jacobian using a MATLAB function. Process noise is Additive — The function calculates the partial derivative of the state transition function f with respect to the states (∂f/∂x). The output is an Ns-by-Ns Jacobian matrix, where Ns is the number of states. To see an example of a Jacobian function for additive process noise, type edit vdpStateJacobianFcn at the command line. Process noise is Nonadditive — The function must also return a second output that is the partial derivative of the state transition function f with respect to the process noise terms (∂f/∂w). The second output is returned as an Ns-by-W matrix, where W is the number of process noise terms in the state transition function. Process noise is Additive — Specify the covariance as a scalar, an Ns-element vector, or an Ns-by-Ns matrix, where Ns is the number of states of the system. Specify a scalar if there is no cross-correlation between process noise terms and all the terms have the same variance. Specify a vector of length Ns, if there is no cross-correlation between process noise terms but all the terms have different variances. Process noise is Nonadditive — Specify the covariance as a W-by-W matrix, where W is the number of process noise terms. If the process noise covariance is time-varying, select Time-varying. The block generates input port Q to specify the time-varying covariance. This parameter is enabled if you do not specify the process noise as Time-Varying. If you select this parameter, the block includes an additional input port Q to specify the time-varying process noise covariance. Initial state estimate value, specified as an Ns-element vector, where Ns is the number of states in the system. Specify the initial state values based on your knowledge of the system. State estimation error covariance, specified as a scalar, an Ns-element vector, or an Ns-by-Ns matrix, where Ns is the number of states of the system. If you specify a scalar or vector, the software creates an Ns-by-Ns diagonal matrix with the scalar or vector elements on the diagonal. Specify a high value for the covariance when you do not have confidence in the initial state values that you specify in Initial state. The measurement function calculates the N-element output measurement vector of the nonlinear system at time step k, given the state vector at time step k. You create the measurement function and specify the function name in Function. For example, if vdpMeasurementFcn.m is the measurement function that you created and saved, specify Function as vdpMeasurementFcn. The inputs to the function you create depend on whether you specify the measurement noise as additive or nonadditive in Measurement noise. where y(k) and x(k) are the estimated output and estimated state at time k, and Um1,...,Umn are any optional input arguments required by your measurement function. For example, if you are using a sensor for tracking an object, an additional input could be the sensor position. To see an example of a measurement function with additive process noise, type edit vdpMeasurementFcn at the command line. To see an example of a measurement function with nonadditive process noise, type edit vdpMeasurementNonAdditiveNoiseFcn. You can create h using a Simulink Function block or as a MATLAB function (.m file). You can use a MATLAB function only if h has one additional input argument Um1 other than x and v.
The software generates an additional input port MeasurementFcniInputs to specify this argument for the ith measurement function. If you are using a Simulink Function block, specify x and v using Argument Inport blocks and the additional inputs Um1,...,Umn using Inport blocks in the Simulink Function block. You do not provide Um1,...,Umn to the Extended Kalman Filter block. If you have multiple sensors in your system, you can specify multiple measurement functions. You can specify up to five measurement functions using the Add Measurement button. To remove measurement functions, use Remove Measurement. on — You create a function to compute the Jacobian of the measurement function h, and specify the name of the function in Jacobian. For example, if vdpMeasurementJacobianFcn.m is the Jacobian function, specify MeasurementJacobianFcn as vdpMeasurementJacobianFcn. If you create h using a Simulink Function block, then create the Jacobian using a Simulink Function block. If you create h using a MATLAB function (.m file), then create the Jacobian using a MATLAB function. Measurement noise is Additive — The function calculates the partial derivatives of the measurement function with respect to the states (∂h/∂x). The output is as an N-by-Ns Jacobian matrix, where N is the number of measurements of the system and Ns is the number of states. To see an example of a Jacobian function for additive measurement noise, type edit vdpMeasurementJacobianFcn at the command line. Measurement noise is Nonadditive — The function also returns a second output that is the partial derivative of the measurement function with respect to the measurement noise terms (∂h/∂v). The second output is returned as an N-by-V Jacobian matrix, where V is the number of measurement noise terms. Measurement noise is Nonadditive — Specify the covariance as a V-by-V matrix, where V is the number of measurement noise terms. If the measurement noise covariance is time-varying, select Time-varying. The block generates input port Ri to specify the time-varying covariance for the ith measurement function. If you select this parameter for the measurement noise covariance of the first measurement function, the block includes an additional input port R1. You specify the time-varying measurement noise covariance in R1. Similarly, if you select Time-varying for the ith measurement function, the block includes an additional input port Ri to specify the time-varying measurement noise covariance for that function. Suppose that measured output data is not available at all time points at the port y1 that corresponds to the first measurement function. Select Add Enable port to generate an input port Enable1. Use a signal at this port to enable the correction of estimated states only when measured data is available. Similarly, if measured output data is not available at all time points at the port yi for the ith measurement function, select the corresponding Add Enable port. If you select this parameter, a state estimation error covariance output port P is generated in the block. Use this parameter to specify the data type for all block parameters. Block sample time, specified as a positive scalar. If the sample times of your state transition and measurement functions are different, select Enable multirate operation in the Multirate tab, and specify the sample times in the Multirate tab instead. This parameter is available if in the Multirate tab, the Enable multirate operation parameter is off. Select this parameter if the sample times of the state transition and measurement functions are different. You specify the sample times in the Multirate tab, in Sample time. Ports corresponding to state transition function — Additional input to state transition function StateTransitionFcnInputs and time-varying process noise covariance Q. The sample times of these ports must always equal the state transition function sample time, but can differ from the sample time of the measurement functions. Ports corresponding to ith measurement function — Measured output yi, additional input to measurement function MeasurementFcniInputs, enable signal at port Enablei, and time-varying measurement noise covariance Ri. The sample times of these ports for the same measurement function must always be the same, but can differ from the sample time for the state transition function and other measurement functions. This parameter is available if in the Multirate tab, the Enable multirate operation parameter is on. 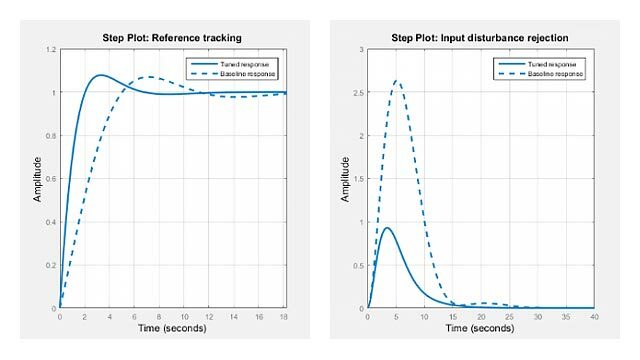 Use an Extended Kalman Filter block to estimate the states of a system with multiple sensors that are operating at different sampling rates. Estimate the states of a discrete-time Van der Pol oscillator and compute state estimation errors and residuals for validating the estimation. The residuals are the output estimation errors, that is, they are the difference between the measured and estimated outputs. 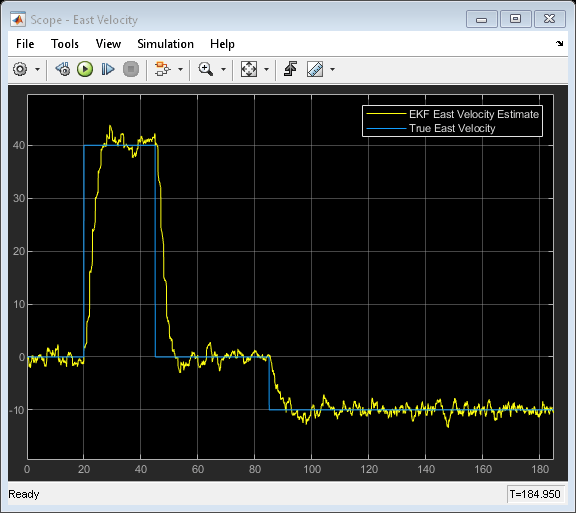 Estimate the states of a nonlinear system using an Unscented Kalman Filter in Simulink™. The example also illustrates how to develop an event-based Kalman Filter to update system parameters for more accurate state estimation. This example also requires Simscape™ and Stateflow®. The algorithm computes the state estimates x^ of the nonlinear system using state transition and measurement functions specified by you. You can specify up to five measurement functions, each corresponding to a sensor in the system. The software lets you specify the noise in these functions as additive or nonadditive. Here f is a nonlinear state transition function that describes the evolution of states x from one time step to the next. The nonlinear measurement function h relates x to the measurements y at time step k. w and v are the zero-mean, uncorrelated process and measurement noises, respectively. These functions can also have additional optional input arguments that are denoted by us and um in the equations. For example, the additional arguments could be time step k or the inputs u to the nonlinear system. There can be multiple such arguments. Note that the noise terms in both equations are additive. That is, x(k+1) is linearly related to the process noise w(k), and y(k) is linearly related to the measurement noise v(k). For additive noise terms, you do not need to specify the noise terms in the state transition and measurement functions. The software adds the terms to the output of the functions. The state transition, measurement, and Jacobian functions that you specify must use only the MATLAB commands and Simulink blocks that support code generation. For a list of blocks that support code generation, see Simulink Built-In Blocks That Support Code Generation (Simulink Coder). For a list of commands that support code generation, see Functions and Objects Supported for C/C++ Code Generation — Category List (MATLAB Coder).